VetsHQ’s self-directed service technology makes veteran information accessible and affordable for all veterans and their families. It’s no longer understandable just by federal employees, claims processors and administrators. Most people will never have the time or the understanding to bravely wade through nearly 24,000 pages of veterans benefits regulations in the Title 38 U.S. Code, Title 38 Code of Federal Regulations, or the manuals of the U.S. Department of Veterans Affairs. VetsHQ tips the scales toward a veteran community long underserved by the status quo — a veteran information system that has kept its key constituency at arm’s length and at the mercy of a heavily bureaucratic and cold, agnostic process. We call it the “Iron Wall of Paper and Indifference.” You’ve seen the photos. 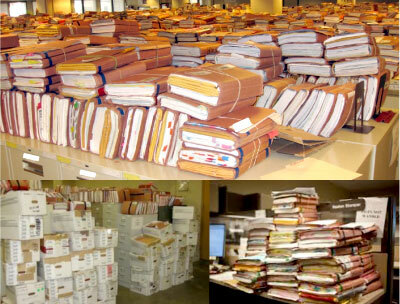 Stacks and stacks of veteran benefits claims files littering claims processing centers, forgotten to all and evidence of a broken process that fails to acknowledge the humanity behind each one of those claims files. VetsHQ values veteran information that is bottom-up engagement rather than top-down regulation, evident in our collaborative, peer-to-peer communication platform and active participation benefits assessment application. It’s the democratization of veteran information. Our approach allows anyone, anywhere to better understand veteran benefits and contribute to that understanding. VetsHQ unites veterans from World War II, Korea, Vietnam, Gulf War, and Iraq and Afghanistan service periods, as well as veterans’ spouses, surviving spouses and children, caregivers and veterans advocates in a process that is more collaborative, more democratic, more accessible, and socially responsible. It’s clear that VetsHQ’s accessible, affordable approach to veteran information results in a more enriching, empowering experience for everyone.